SEATTLE, Feb 27, 2009 (BUSINESS WIRE) -- Kindle 2's experimental text-to-speech feature is legal: no copy is made, no derivative work is created, and no performance is being given. Furthermore, we ourselves are a major participant in the professionally narrated audiobooks business through our subsidiaries Audible and Brilliance. We believe text-to-speech will introduce new customers to the convenience of listening to books and thereby grow the professionally narrated audiobooks business. Therefore, we are modifying our systems so that rightsholders can decide on a title by title basis whether they want text-to-speech enabled or disabled for any particular title. We have already begun to work on the technical changes required to give authors and publishers that choice. With this new level of control, publishers and authors will be able to decide for themselves whether it is in their commercial interests to leave text-to-speech enabled. We believe many will decide that it is. QUESTION: How do I build my mailing list? Attract visitors to my site? And keep them coming back? Basically I would say to build your mailing list start with actually networking on the Internet. If you are shy, become unshy about selling your book, but don't just go around shouting I gotta book, buy it, buy it, buy it. That would be considered rude and also sometimes it´s called spamming! Don't do it because you'd be getting flame and you would gain a bad rep.
Join reader and writers groups, asked to be featured or post reviews you have received about your book. Ask readers to read an excerpt and comment on it and hold contests. That's always a good one. Make them fun and imaginative and get readers talking about your book. A blog is a great way to be able to attract readers to come and return and then invite more readers to "YOUR" forum or as some authors like to put, "their show." You can do a lot from a blog. From just letting your readers get a glimpse of your book to reading a passage for them or even acting it out. You can provide information that your book topic touches on and find ways for them to learn more through you by coming back. To get a lot more traffic to a blog, you actually have to visit other blogs and post comments on there. The more groups you join and interact with on the internet the more chances you have at catching readers and getting them to follow you back to your website and buying a book. Remember the Covey law, the purchaser must see the product at least seven times before finally buying it. Other than the groups, you can interact with readers at places like myspace.com and Yahoo 360. There are a lot of networking sites that you can visit and join. Keep track of them and your password and visit them often. Don't just join to get a page. Join with the intentions of actively going and visiting the other pages, commenting on blogs, pictures, the page itself and connecting other friends. Once you have attracted your readers to your site, you want to keep them and have ways for them to sign up to give you their email address. Forms, newsletter sign up, and even sign ups for special free reads will give you a bevy of internet addresses that you can use for all your promotions. We're all six degrees of separation of people and three from our goals. The World Wide Web helps us get to them even faster. Use it wisely. We invite you to vote in the Reader's Choice Awards this year. Vote for your favorite books and authors. Authors don't forget, you can't win if you don't vote. Feel free to tell your friends, family and fans. For those who sent in your websites, thank you. I'm updating daily. I will be contacting you if you have a 2009 release. This email was sent to yexsenia2@yahoo.com by sormag@yahoo.com. There are so many great advantages of reading e-books. Perhaps you believe in being friendly to the environment in which case it is good to know that no trees had to be cut down to make the book. This also means that the costs of the book are substantially cheaper too. There is no need spending hours in a book store looking for that next great novel because you can simply go online and even get teasers about the book you are thinking about purchasing. When you do finally pick one, there is no one else in line so you are in, out and reading the book faster then ever before. The advantages of reading e-books continues even further to include the fact that you do not need as much space for them because they can be stored on your computer, a CD or even on a flash drive. Some cell phones today are also capable of not only storing these books, but also allowing you the ability to read them which makes them even better. 24 hours a day and 7 days a week, the online stores never close so if you finish a book in the middle of the night you simply purchase another one with ease. Best of all though, you can change their fonts which makes reading an e-book even easier. With all of the advantages of reading e-books, it is sometimes a mystery why people still purchase hard copies. Do yourself a favor and make that next great novel you purchase, an electronic one. Currently Kindle is the best E-book reader. Find out more by reading our kindle reviews from http://www.kindlereview.org. Can E-Book Publishing Make You Rich? Can Anyone Create a EBook and Make Some Decent Money in the Process? EBook Secrets - Can You Really Promote Your EBook For Free? Congratulations to Sylvia Hubbard, 2008 Community Literary Legend Author from The Black Authors Network! Subject: Congratulations to Sylvia Hubbard, 2008 Community Literary Legend Author from The Black Authors Network! from The Black Authors Network! To Listen to the Show announcement, please go to: EDC Creations Virtual Award Show. "She is a truly multi-faceted woman," Ella Curry, founder of The Black Authors Network. Free Novels Available on the site! Greetings authors! Thank you so very much for sending me your book info. I have "caught up" on listings. If you have yet to email me your book title and ISBN which is available on Amazon.com, please email them to me at chipanugget@ juno.com and I´ll get them listed. *Your book is not listed at Amazon.com or you may have sent the wrong ISBN. *You sent multiple titles, that´s okay, but I am trying to space out authors individual titles and the balance of your titles will soon appear. *I might have messed something up adding your book (go figure! LOL). Please re-send information. For some reason, I sent out 376 of this notification and my sent messages showed only 114 sent. So if you all could forward this message to other "authors" on your friends list, I would appreciate it. We have over 400 authors here (many with more than 1 book), but I have received only a handful of books to list. If you haven´t, I strongly encourage you to take advantage of this for your benefit as well as helping to support our site. You are all wonderful!!! ! Thanks for everything you do to help promote us! we're preparing for the go green campaign and i need two male ebook authors asap. We'd prefer ebook only, but if it's available in ebook and paperback that's fine. We'd also like a recently published book. As with the majority of MWN promotions, we want the author to be from Michigan or the book about Michigan. Thank you. attach a pic of author and book too. dO NOT SEND PDF ATTACHMENTS PLEASE! If I don't have the information requested as is, I will have to delete the email. I do not have the time to find your information for YOUR free promotion. Ebooks sell well online, because people are hungry for information they can use right away. If you'd like to create ebooks and sell them but feel you don't have time, short ebooks are the answer. You can create and start selling them within three days. When they buy an ebook, buyers want a solution to a problem they have right now. For example, someone who's switching from a Windows computer to a Mac, wants to know basic information, and they're willing to pay for it. They're nervous: the machine is sitting in front of them. When considering solutions you could offer, consider your own expertise. Everyone's an expert in something. Look at problems you've solved in the past. For example, perhaps you learned how to get a fractious baby to sleep, conquered acne, or lost 50 pounds on a diet you created yourself. You could write short ebooks on all these solutions and sell them. Short ebooks are short, usually less than 20 pages, sometimes fewer than ten pages. Remember, your buyers want solutions. They don't want to wade through 100 pages of waffle with a nugget of actionable information in the center -- they just want the steps they can use to solve their problem, right now. Get your short ebook written, and convert the file to PDF. captures, if they're necessary. If they're not necessary, forget about them. Your final step is to write a sales page, and then advertise your short ebook. A long sales page is unnecessary; make it short and to the point. Describe the problem, and offer the solution to the problem -- your ebook. Once your sales page is online, advertise your ebook. Pay Per Click advertising is the most efficient way to sell. So there you have four steps to creating fast info products which sell. Get started today. Want to make great money writing and selling ebooks? Angela Booth's bestseller "Write and Sell an eBook: Every Writer's Quick-Action Guide To Writing Ebooks" at http://www.abmagic.com/ebooks/write-ebooks.html shows you how to develop a great new career. For free weekly writing tips sent to your Inbox, subscribe to Angela's Fab Freelance Writing Ezine at http://www.freelancewritingezine.com/ and receive "Write And Sell Your Writing: The Power-Write Report" immediately. Article: Can You Really Make Money With EBooks in a Recession? Can You Really Make Money With EBooks in a Recession? On Michigan Literary Network! Tomorrow! Join us February 18, 2009 5pm for The Michigan Literary Network show at: http://blogtalkradio.com/MichiganLiteraryNetwork with your radio host and Motown Writers Network founder, Sylvia Hubbard. We'll be speaking to Ministry Marketing Solutions, Christian Guru, Pam Perry and owner of Shaman Drum, Karl Pohrt. Please take this time and visit their websites and supports their endeavors and then join us! Contact Us, if you'd like to be a guest. Everything You Ever Wanted and More In a PR Kit. Just Released! will have you sitting on top! DON'T FORGET: Host Monica Marie Jones will be talking about The literary world and marketing on a budget on The Michigan Literary Network Radio Show LIVE Wednesday, February 11, 2008 @ 6:00 PM. Featuring Author, Marquita Scott, Renee Alexis and more! Click Here to register for a reminder or if it's afterward, listen to the podcast. PR Boot Camp Orientation call...are you ready for this? I'll tell you what to expect. Congratulations on writing your first book. but you actually did it. Way to go. how to even take the first step. That's where I come in........I am here to help as your "PR Coach." I will also answer your questions and see if you're ready. The teleclasses start next Tuesday 2/17. Have you ever wanted someone you could talk to about your book and ministry goals, someone who would mentor you, help you stick to deadlines, and give you a gentle push whenever you felt creatively blocked or hit a brick wall? Someone who would help you "crack the code" of internet marketing? Better yet, wouldn't it be great to learn how to do your own marketing and PR to get media hits and secure tons of free publicity that would get you a lot of speaking engagements as a result. To learn how to really plan and market online and offline - continuously. What if you could take part in a program where you can learn strategies that would catapult you to incredible heights in your writing career? You can get in the next 4-week PR Boot Camp starting Tuesday, Feb. 17..
some direction for your book campaign. You will get resources and the perfect ad plan to reach the masses. If you're financially able to hire a publicist and marketing agency, seriously consider retaining Ministry Marketing Solutions. However, if you like me and not financially able YET, (operative word is YET) you must sign up for the owner and Chief Visionary's, Pam Perry, PR & Marketing Boot Camp like I did. If you actively participate you will be well on your way to building a brand that will last, taking your ministry to the next level; and, on the right track to becoming financially fit. Pam Perry's PR & Marketing Boot camp armed me with practical and indispensible tools that are helping assure success in fulfilling my call to share through writing, speaking, and the performing arts, that faith, prayer and sharing our testimonies empower us to walk out God's word in Revelation 12:11, "We overcome by the Blood of the Lamb and the word of our testimony" and Jeremiah 29:11, God says, I alone know the plans I have for you, plans for prosperity and not disaster, plans to give you a future and a hope." While I've had a internet presence since 1999, there was a lot I didn't know about how to use it to my full advantage; especially keeping up with the ever increasing technology and social networking options. The boot camp covered how to best use those options, but also how to monetize your brand, write press releases, media alerts, how to pitch the media, press kits, how to keep people coming back to your website, blogs, how to maximize use of Youtube, Facebook, MySpace, and Twitter. Pam Perry's PR & Marketing Boot Camp, is professionally executed with a carefully designed mix of one-on-one sessions that help personalize your experience; group teleconferences; individual and group strategy sessions, teleseminars and lectures, written and research exercises, email communication, as well as helping the participants form collaborative alliances; which she dubs, Snergy Energy. I've practically and easily implemented many of Pam Perry's suggestions, and they are working! I've established a more impactful and brand conscious presence on twitter, facebook, and other social network; as well as initiated a more interactive blog and website. Her teaching technique is easy-like-Sunday-morning, peppered with personal and professional anecdotes, with a touch of humor to make the information more desert-like than medicinal. I only accept no more than a few people nationally at a time and you will be in a group coaching session (going over your PERSONAL strategy via email). As your PR coach, I am like . . . Your own personal trainer to enable you to achieve your book goals . Your mentor during the PR process. Your inspiration telling you that you can do this. And most importantly, your partner in helping you achieve success with your book. During each coaching session I will discuss and explore your book's goals, wins, challenges and opportunities as well as develop fieldwork and special reports. Fieldwork isn't like the homework you were assigned in school. It consists of action steps to move you closer toward your goals and dreams. o Initial assessment to evaluate work and needs and establish goals. o Exercises to increase industry knowledge, encourage creative thinking, and develop practical skills plus media contacts! o PR / Marketing strategies for ongoing support after the Teleclass up to 2 months. Understand how to use the Internet to market your book - to save you hundreds of hours, thousands of dollars, endless frustratiobon and increase your sales like never before! Coaching sessions are scheduled weekly for an hour via phone. Coaching is $500 for four weeks. 1. I'll evaluate and improve your marketing plans.! It's easy to focus on the trees and miss that great big forest right before your eyes! Once your book is ready for the publisher (or back), it's time to tweak your plans for retail and bulk book sale. I'll review your marketing materials, looking specifically for potential readers and the strategies to win them. I'll save you time and energy by providing the accurate and honest feedback you'll need to succeed. I'll show you a "forest" of sales possibilities! 2. I'll develop and refine your ideas. You have great promotional ideas. Some are easy to put into practice and others need refining. I have working knowledge of hundreds of PR strategies - and the marketing know-how to tailor your book campaign. 3. Tap into my wealth of PR strategies and secrets. When you've "run out of ideas" to market and sell your book, I will re-energize you! I'll educate you on the industry and the PR principles that will win results. 4. I'll give you the contacts you need. In my two decades in PR I've amassed a rolodex full of media and publishing contacts. I'll put you in touch with those I do know - and dig up anyone else that you need to know. 5. I'll hold you accountable. It's tempting to put off the PR tasks that are crucial to the marketing and sales of your book. I'll guide you and hold you to the task. You've invested too much in your book not to reap the rewards! I'll coach you to your highest potential and stick with you until you cross the finish line. Are you ready to kick your writing career to the next level? "I would first like to thank you for everything you have done for me thoughout this PR Bootcamp. The information you shared was priceless and your one on one attention to my particular needs, as a poet, were uncanny to say the least." You can use me as a sounding board to discuss your objectives, new ideas, strategies and results. Coaching from me can prevent you from wasting your marketing dollars! P.S. 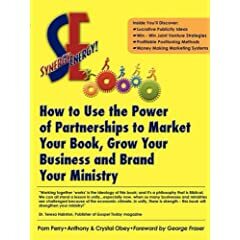 As a bonus you'll get The Christian Writers Market Guide and a new copy of Synergy Energy: How to Market Your Book, Grow Your Business and Brand Your Ministry. Plus four Book Marketing Cds from Conferences where I spoke last year! You'll also get a workbook filled with resources, worksheets and contacts. (A $200 value Total). take the survey there...are you ready to publish?? Fw: Do you have your own blog?